Renowned designer Maarten Baas was commissioned to take press and other visitors on a “BAAS Design Tour” around different spots during Dutch Design Week. The tour was going to start at a key location, Eindhoven’s Central Station, but he crashed his white van on a post and cancelled the tour. However, there was plenty to see inside the Mercedes sprinter vehicle, as he created a small living space full of his wonderful quirky designs that wowed visitors and passersby! Maarten Baas was born in Germany but grew up in The Netherlands, graduating from the renowned Design Academy of Eindhoven. He is well known for his Smoke Series, for which he literally burned iconic furniture pieces including some classics from Rietveld, Eames and Gaudi. Since 2005 he has worked with Bas Den Herder in their studio at Hertogenbosch. A faithful contributor to Dutch Design Week, Baas takes the yearly opportunity to show his latest and most quirky creations at the grand show. For the last edition — which finished a couple of weeks ago — he created a tragic but humorous story that got everybody’s attention and left some people shocked. 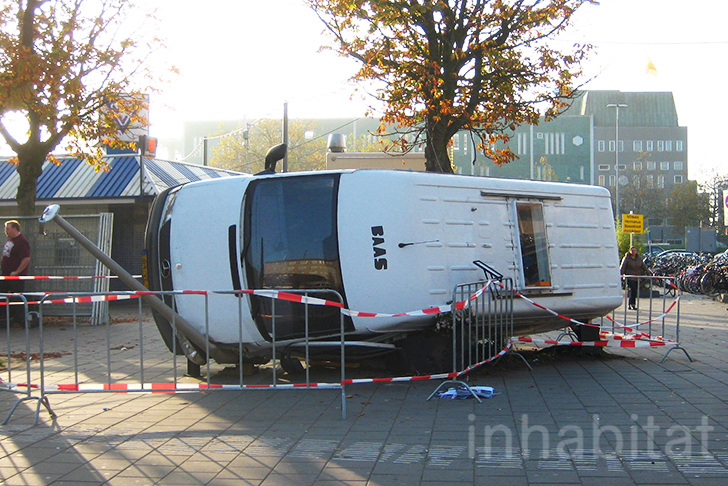 Baas’ public spot consisted of a white van that seemed to have crashed onto a lamp post right next to Eindhoven’s central train station. But the truth is that the whole story about the accident and design tour was just a joke. By peeking through the van’s top window, people could discover the van’s interior and enter Baas’ magical design world. Inside the van, there was a whole setting full of his designs and it looked like somebody was actually living there. A cheeky charlatan, an exceptional storyteller or a design genius, Maarten Bass’ Unexpected Interaction at Dutch Design Week demonstrates that modern design is really about creating new stories. Maarten Baas was born in Germany but grew up in The Netherlands, graduating from renowned Design Academy of Eindhoven. 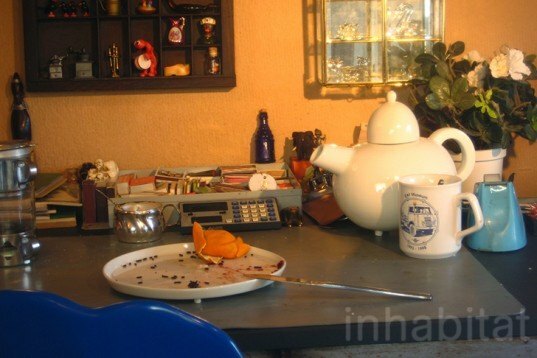 He is well known for his Smoke Series were he literally burned iconic furniture pieces including some classics from Rietveld, Eames and Gaudi. Since 2005 he works together with Bas Den Herder in their studio at Hertogenbosch, not far from the city that saw him achieving his diploma. A faithful contributor to Dutch Design Week, Baas takes the yearly opportunity to show his latest and most quirky creations at the grand design show. For the last edition -- which finished a couple of weeks ago -- he created a tragic but humorous story that got everybody’s attention and left some people shocked. 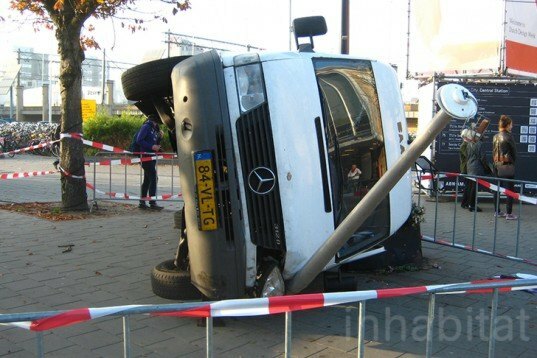 Baas’ public spot consisted of a white van that seemed to have crashed onto a lamp post right next to Eindhoven’s central train station. But the truth is that the whole story about the accident and design tour was just a joke. By peeking through the van’s top window, people could discover the van’s interior entering Baas’ magical design world. Inside the van, there was a whole setting full of his designs and it looked that somebody was actually living there. 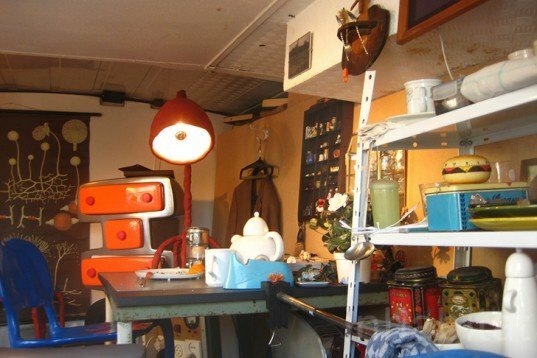 Many pieces of Baas’ Clay Furniture collection were on site, together with a desk full of stuff, some clothes on a hanger and lighted lamps. Burnt out matches, plants with flowers and a beautiful tapestry inspired by nature were also part of the installation. A cheeky charlatan, an exceptional storyteller or a design genius, Maarten Bass’ Unexpected Interaction at Dutch Design Week just shows as that modern design is really about creating new stories.